However, VTOLs—which combine the convenience of vertical takeoff and landing like a helicopter with the efficient aerodynamic flight of an airplane—could play a niche role in sustainable mobility for longer trips, according to the study, scheduled for publication April 9 in Nature Communications. 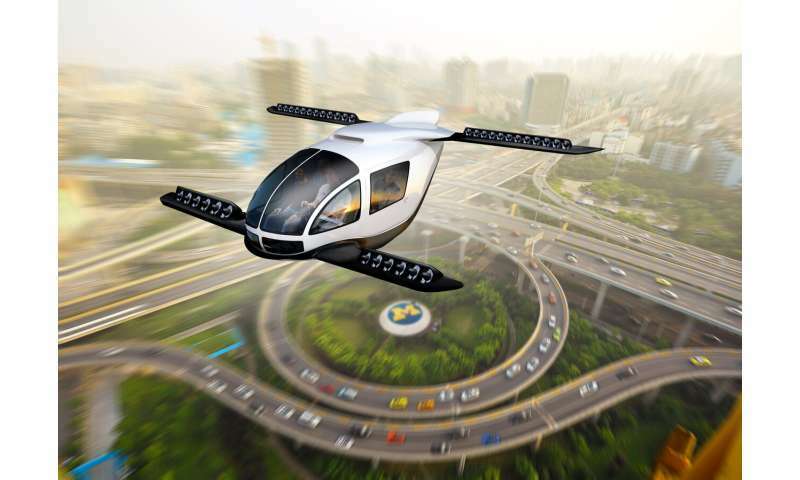 Several companies around the world are developing VTOL prototypes. "To me, it was very surprising to see that VTOLs were competitive with regard to energy use and greenhouse gas emissions in certain scenarios,"
Sure. To a limited extent. But if we're looking at a "Jetson's" scenario I wouldn't vouch for noise pollution levels being anything but deafening. Think of the occasional helicopter in a city sky. You can often (faintly) hear it. Now scale this down to a one seater octacopter and then scale it back up a hundred (a thousand? ten thousand?) times to make an appreciable dent in traffic. For comparison: 270000 cars cross the bay bridge in San Francisco every day. That's only one of four major bridges. what gets really annoying about the energetic analysis of transport is that time and again people forget that the transport works in conjunction with the static set of 3d locations to which people would fly it to. you cannot assess a transport system independently of the set of locations and the time and frequency dynamics of necessary and discretionary trips that people would make. IT'S A NETWORK PEOPLE!!!! Aesthetically, flying cars and the like will be a disaster. Night sky turned into a freeway. Noise raining down from above, unless someone finds a way to make quiet propellers. Accidents will often be lethal to people who were no where near a street. Debris from a collision will crash through the roofs of unsuspecting individuals. I'd like a personal VTOL/flying car for myself, but it just does not scale. Were they comparing these with best-available vehicles, such as EVs or even just 54 MPG Priuses? If they're looking at the average 25 MPG it isn't meaningful because that level of efficiency is already technologically obsolete. Accidents will often be lethal to people who were no where near a street. While I agree with the rest of your comments accidents is the one thing I wouldn't worry about because these things will be fully autonomous. There's no way anyone will be allowed to fly these by hand and on any route they want to if there's any appreciable number of them in the sky. Safe autonomy (or safe guided pathing from a central traffic control which you log into) in 3D space - with VTOL to boot - is incredibly easy. accidents is the one thing I wouldn't worry about because these things will be fully autonomous. I would worry about it even more in that case. Without pilots to take over from the automation, you can down tens of thousands of these vehicles with one electrical or software fault in the system, or just because your AI couldn't handle an edge case. If you know absolutely nothing about the subject. Airplanes run with such "safe autonomy" already, leaving kilometers of space between the corridors, and still they manage to crash into each other occasionally. Though of course, when the automation has run the airplane into a corner where it can't back out,the resulting crash is always put down or at least partially blamed as "human error" and the people are blamed for issues largely caused by automation that is too dumb for the task. That comes naturally, because the airplane manufacturers can't admit that their systems are fundamentally unsafe and simply waiting for the accident to happen; the bugs are fixed in silence and the rest is PR. The public gets the illusion that the computers can't err and Artificial Intelligence is already here. Leaving aside the other questionable assumptions mentioned above the study compares apples to oranges: full occupancy VTOLs vs 1.54 person occupancy ICE vehicles. Assuming that humans will change their occupancy behavior for VTOLs is just silly. Since the VTOLs require a pilot that means 3 person VTOL occupancy at 48% of the emissions. Adjusting for occupancy to get apples to apples results in only a 4% difference in emissions - in essence a push. Also, no city government is their right mind is going to allow hundreds of thousands of VTOLs (minimum required to make a dent in surface traffic), in their airspace. Surface vehicle failures can pull off to the roadside - VTOL vehicles will come crashing down. And with thousands of VTOLs there WILL be failures - not just in flight collisions. Most of these comments are very cogent. As a private pilot, I shudder at the thought of remotely piloted electric vehicles (RPeVs) crowding the sky so that I cannot take off or land at a local airport, much less, travel on a 400 mile trip in congested skies. But wait, you say, who said anything about remote pilots? I suggest this is the only way to use these contraptions because the weight of the pilot is a lost passenger, and that costs profit. Self driving machines. Boeing 737 MAX 8. Most single-occupancy commutes are local. Longer trips are taken more often with company, or with cargo on-board such as deliveries. Since these vehicles have to be operated point-to-point to avoid local noise issues and endangering the public by crashing over residential zones, they are likely to be used like inter-city busses rather than private single occupancy vehicles. The reason why they will be operated like busses is because of the last mile problem: once you get there, you still have to drive to your destination, because you can't just land on someone's driveway. The riders need to catch a bus or taxi after they land, so they have to land near a public transportation hub.